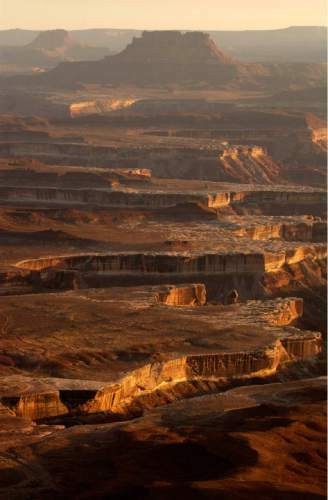 Utah's largest national park spans 527 square miles, with 3 districts. Francisco Kjolseth | The Salt Lake Tribune Mountain biker Joey Prokop of Salt Lake City rides up the Hard Scrabble ascent on the White Rim Trail in Canyonlands National Park in May, 2013. 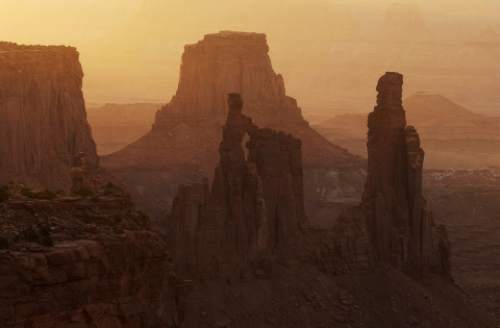 Francisco Kjolseth | The Salt Lake Tribune Overview of The Loop from the saddle that looks down on the Colorado River in Canyonlands National Park, Utah. Francisco Kjolseth | The Salt Lake Tribune Dawn arrives near the Airport Campground during a mountain biking trip on the White Rim Trail in Canyonlands National Park in May, 2013. Trent Nelson | The Salt Lake Tribune Canyonlands National Park in 2013. 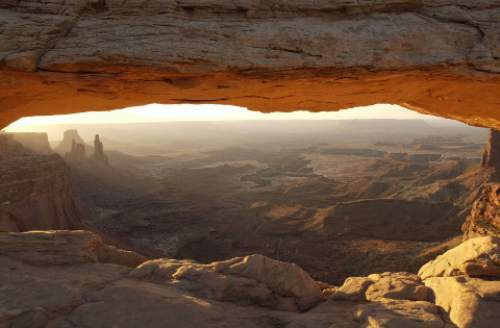 Trent Nelson | Tribune File Photo The view at sunrise from Mesa Arch, in the Island in the Sky district of Canyonlands National Park. 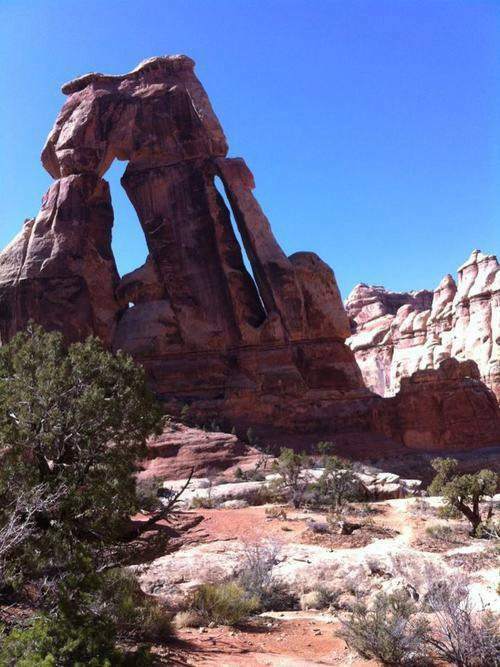 | Courtesy Shane Farver Druid Arch stands in the Needles District in Canyonlands National Park. 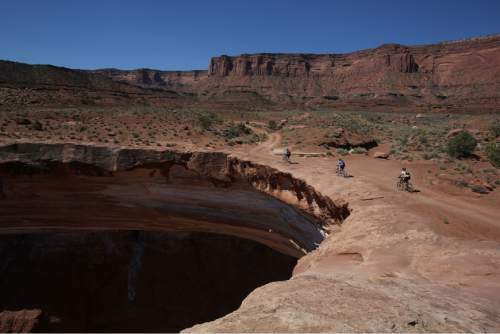 Francisco Kjolseth | The Salt Lake Tribune Mountain bikers ride the edge of the White Rim Trail in Canyonlands National Park in May 2013. 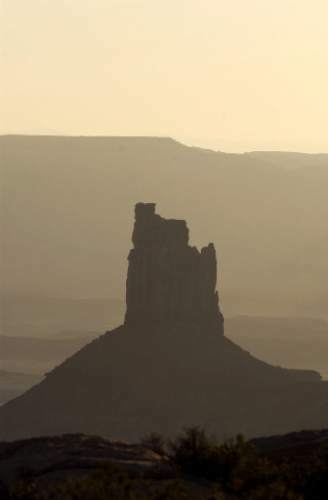 Trent Nelson | Tribune File Photo Candlestick Tower, Canyonlands National Park. 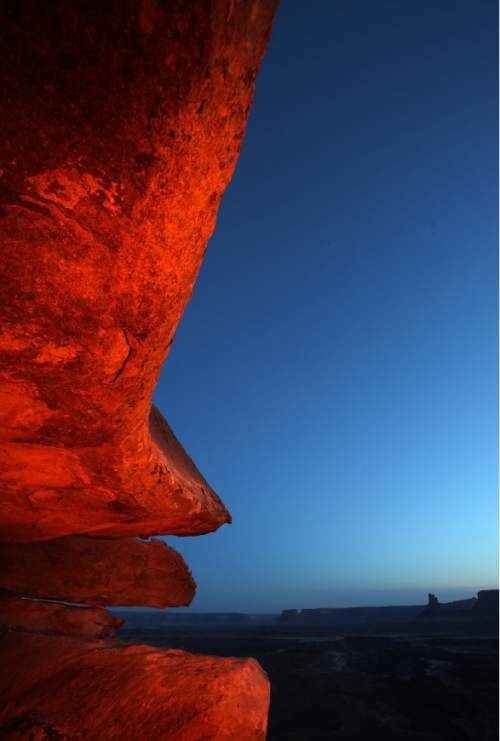 Trent Nelson | Tribune File Photo The view at sunrise from Mesa Arch, in the Island in the Sky district of Canyonlands National Park. 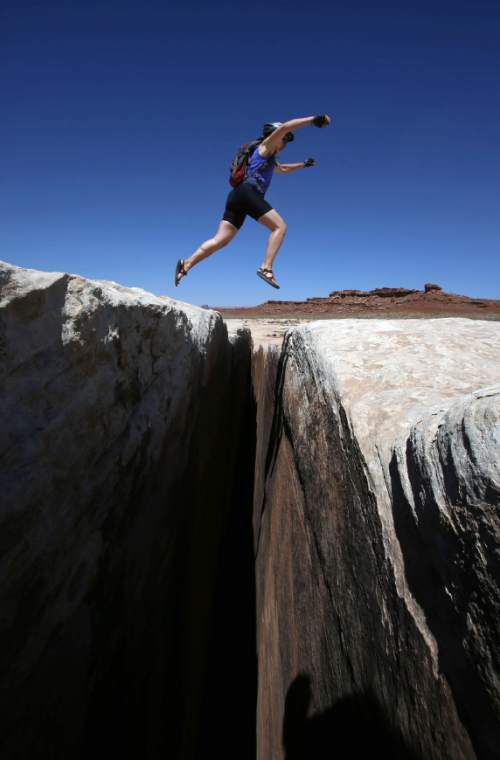 Francisco Kjolseth | The Salt Lake Tribune Tammi Messersmith of Salt Lake City jumps over the seemingly bottomless Black Crack formation during a mountain biking trip on the White Rim Trail in Canyonlands National Park in May 2013. The Colorado River runs through it. So do Jeeps and mountain bikers. Canyonlands National Park is truly a playground, and a large one. At 527 square miles, it&apos;s the largest of the national parks in Utah. It has rivers and deep canyons, domes, mesas, arches and petroglyphs. 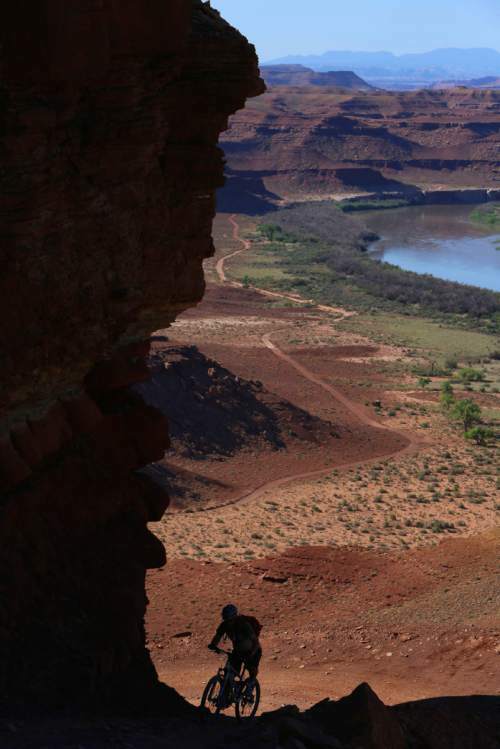 There&apos;s so much in Canyonlands, the National Park Service had to divvy it. The park has three districts: Island in the Sky, the Needles and the Maze. And there&apos;s a noncontiguous part of the park called Horseshoe Canyon. The Maze is the most remote district. The park service&apos;s website for it doesn&apos;t list any day hikes there. But the other districts and Horseshoe Canyon offer great trails. This is the district outside of Moab and that receives most of the park&apos;s tourist traffic. Syncline Trail Loop • Hike this one when you have time and energy. Even then, be sure to start the hike going uphill from the trailhead to get the hard part out of your way. The hike is 8.3 miles long and 1,452 feet in elevation gain. The trail goes over Upheaval Dome Mesa and around a canyon rim. In the right time of year, you&apos;ll see a waterfall. Murphy Point Overlook • If a big grade isn&apos;t for you, try Murphy Point Overlook. There&apos;s only 137 feet of elevation change over 3.58 miles. The trail goes out to and back from a view of the lower canyons and a turn of the Green River. Neck Spring Trail • This may be the one true moderate hike in the park. There&apos;s only 364 feet of elevation change, but it&apos;s over 6 miles across dirt and slickrock. On the way, you see the park&apos;s vegetation and some of the old ranching sites from the days before the area became a park. Gooseberry Trail • The almost 1,500 feet of elevation change isn&apos;t the problem here so much as the loose footing down the switchbacks. But this trail offers great views from the mesa and then a close-up view of the park&apos;s deep canyons. Mesa Arch Trail • Listing this as a trail is almost cheating. The loops is only half a mile and the elevation change isn&apos;t worth mentioning. But you can&apos;t really say you visited Island in the Sky without seeing the wide Mesa Arch and looking at the canyon floors below. This district is more remote, and looks much like Island in the Sky. Druid Arch • This may be the most underrated hike in the entire national park system and worth the 16 miles and 1,000-foot elevation change you will hike. You pass an emerging arch that is just a hole in a rock and will be for the next few thousands years or so. You cross the park&apos;s backcountry, passing the redrock scenery of southeast Utah until you reach the viewpoint for the geometric hodgepodge that is Druid Arch. Slickrock Trail • This is a great hike for someone that may only have a couple hours in the park and wants to get a taste of the geology there. It&apos;s a 2.8-mile loop with only 100 feet of elevation change. It&apos;s all on slickrock with viewpoints that may let you spot a bighorn sheep. Driving there will take you longer than the hike, but this hike if memorable for the Great Gallery  a rock wall filled with petroglyphs. It&apos;s 6.5 miles round trip and has a 557-foot elevation gain.